Are you facing issues with low water pressure, discolored water or having a leaky pipe? If yes, it is about time that you should consider copper re-piping. 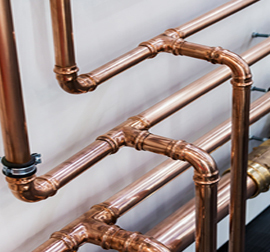 Copper re-piping would help address issues such as scalding showers or extreme temperature fluctuations, unbalanced water pressure, recurring leaks, and noisy plumbing. Do it sooner than later. Highly rated on Yelp, Citywide Plumbing offers copper re-piping services to its customers in San Francisco and neighboring areas. Our certified plumbing team includes experienced, licensed, bonded, and insured plumbers. Our services and solutions are backed with guarantee, quality workmanship. Copper re-piping is the process of replacing the old, galvanized iron pipes at home or business with new copper pipes. No doubt that galvanized iron pipes can break down over time and zinc can start getting corroded, which will result in impure water and choked faucets and fixtures. To avoid this, copper re-piping is required. Copper re-piping supplies clean water throughout the property. It is an ideal solution over galvanized iron pipes as it never clogs up internally or corrodes. Copper pipes are known for being highly durable and can last for almost a century. Copper re-piping is not a provisional replacement or fix of short sections of the pipe but a total replacement of water supply plumbing system. It even adds to the overall value of the property as the majority of prospective buyers focus on investing in a property having state of the art things installed. As copper pipes are biostatic and lead-free, the growth of bacteria and other microorganisms is prevented, due to which they are the most preferred choice for the majority of prospective property owners. Copper re-piping makes sure that you receive odor and rust-free water. Have years of experience combined with ever-expanding knowledge. Are bonded, licensed and insured. Focus on delivery with quality workmanship. Are on time and professional. So, if you are experiencing inconsistent water pressure, bad tasting water, rust spots on washed clothing, inconsistent cold & hot temperature changes, rust or yellow colored water, or leaky pipes, it is the right time to consider replacing the pipes of your property with copper piping. Citywide Plumbing offers quality services throughout South San Francisco, San Francisco, San Bruno, Millbrae, Daly City, Colma, Burlingame, Broadmoor, and Brisbane. We strap and secure all pipes in place. They are isolated for minimum sound and vibration. We always pressure-test and flush out the entire system once the installation of new copper piping is done. For a free estimate, feel free to give us a call at (415) 716-1519 or (650) 993-8159 today!